On June 6th DGIF staff will use a remote trigger to open the pen door and let these young birds take their first flight. In past years we’ve used a door release mechanism comprised of an ice bottle and weight that allowed the door to open without any humans nearby to frighten or panic the young birds. This year a different mechanism will be used that will allow us to control the precise moment the pen opens. This device will be installed the day before and opened once staff and volunteers are in place the morning of June 6th. DGIF staff will monitor the first flights from a variety of vantage points in Richmond buildings as well as the streets surrounding Riverfront Plaza. Volunteers will assist with coverage of the streets below to ensure we can track the flights of all three birds. 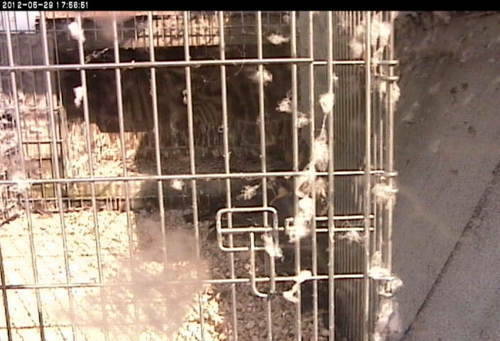 These birds have shed almost all of their down as can be seen by the fluffy feathers festooning the pen. With their flight feathers almost fully grown in they should be more then ready to fly next week.